When a dog or cat eats some whole raw food, they’re compelled to use their minds, psyches and bodies in a way that is positively stimulating. Feeding our pets raw puts them in touch with their natural, innate and dynamic instincts, fuels their bodies in a biologically appropriate way, and so they thrive. Furball’s Choice is dedicated to the well being of your animals, inside and out. We are Quinte’s largest & original source for high quality and reasonably priced raw dog and cat food. Feed your furbabies the way nature intended! Feeding raw has never been easier. All Pet Food products can be purchased directly from our location. We always have products in stock, no need to pre-order. Select from over 300 raw food & treat options, please contact us for an up to date price list. For added convenience, Furball’s Choice offers delivery to your door or delivery directly to your freezer! * Delivery within Furball’s Choice Main Service Area. (Belleville, Trenton, Frankford, Stirling, Shannonville,) is FREE for all orders over $75 (before taxes) every Monday & Wednesday. Orders under $75 are subject to a $10 delivery fee. Note* Not all products are listed on our website. The following product is our House Blend. Please contact us for information on our other products. We currently have our raw products available in Kingston, Belleville, Havelock, Toronto & GTA, Kitchener, London, Sarnia and Manitoba. Please contact us for more information on how to purchase. Healthier digestive & Immune systems. Less poop to scoop. Smaller stools which are small and firm. They also biodegrade quickly and disappear in a few days. Mirrors what a dogs and cats would be getting in the wild. No preservatives, fillers, or chemicals. Naturally cleans teeth and eliminates bad breath. Increased energy and improved mood. Decreased vet bills due to better health. Longer life for your pets. And now, cheaper than commercials diets! By its very nature, all raw dog and cat feed is a much more environmentally friendly product than highly processed pet foods. Processing pet food requires considerable energy input with cooking, drying and packaging. Raw pet feed avoids all this processing and carries the maximum nutritional value straight to your dog. Our suppliers use as much local product as they can find. In an effort to reduce waste, we encourage all our customers to bring their own reusable containers when purchasing our feed. We offer durable reusable bags, if needed. Check out the Frequently Asked Questions for more information, or visit the Leerburg’s Q&A on Feeding a Raw Diet. for some very detailed information, including information on raw feeding myths, directly from world known champion bloodlines breeder and trainer, Ed Frawley of Leerburg. 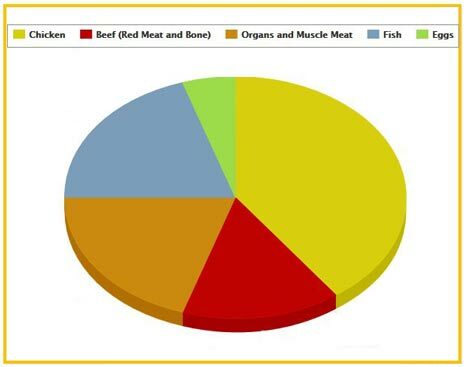 Dry matter feed analysis shows 49% high quality protein, 35% fat, 6% ash, and 10% dry matter - a biologically appropriate formulation similar to the natural ancestral canine diet. The ingredients are fine ground and mixed together then frozen in 40 pound blocks. The blocks are pre-cut into convenient thawing and serving sizes. Contact us for more information on our raw feed products or with any questions you may have, including how to transition your kibble fed puppies/kitten and dogs/cats to raw feeding. Our trained and experienced staff will be happy to assist you. Use our calculator below to get a general idea of how much to feed your pets daily as well as other information.